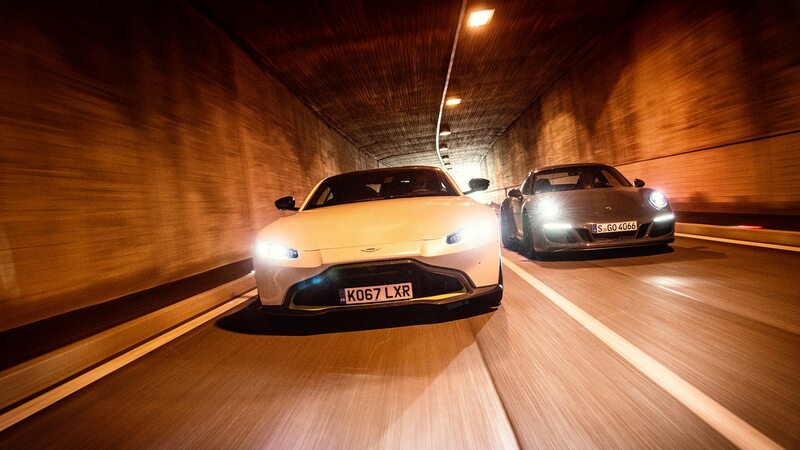 Two of Germany’s best take on Aston’s new Vantage. The winding road that forks off to the right dead-ends about 3,000 feet below the Timmelsjoch summit. Before things get serious, we explore the lightly trafficked terrain at a leisurely pace, just in case there are any stray cattle, odd mudslide remnants, or authorities trying to boost end-of-month revenues. As expected, the long climb is clear except for some roadwork sections and a barking-mad, car-chasing shepherd dog. 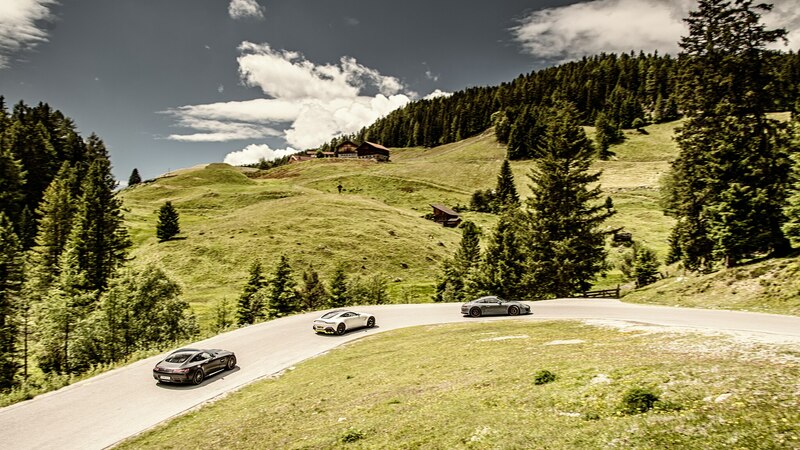 An hour later, at the bottom of the narrow, almost symmetrically V-shaped valley, our trio lines up for the first serious run up the big hill: the latest Aston Martin V8 Vantage, Mercedes-AMG GT C, and Porsche 911 Carrera 4 GTS. 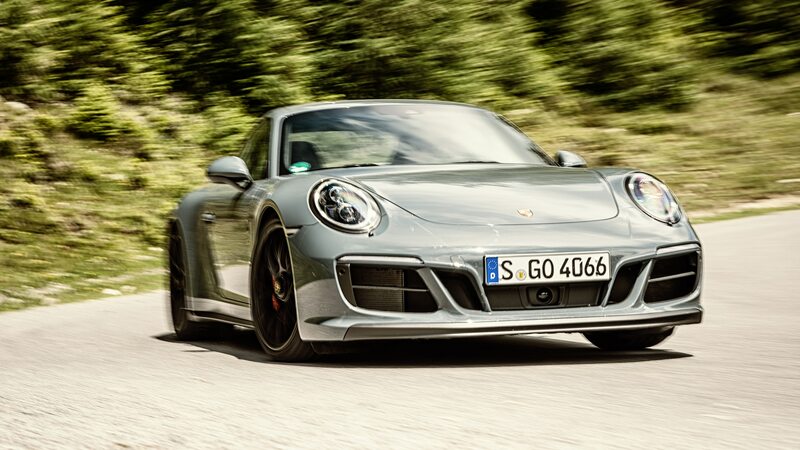 The Porsche stampedes away, its trademark flat-six staccato trailing behind. 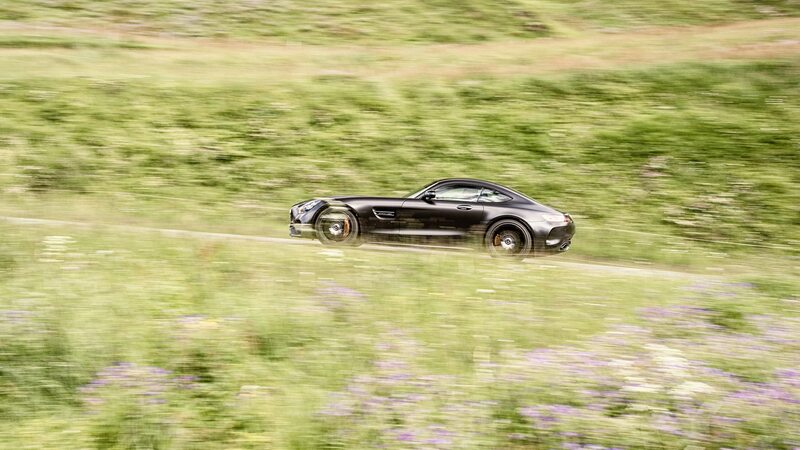 Next, the AMG growler from Affalterbach scrambles into position before it takes off and storms away with such thunderous noise that we expect a health and safety complaint from the nearby wildlife. 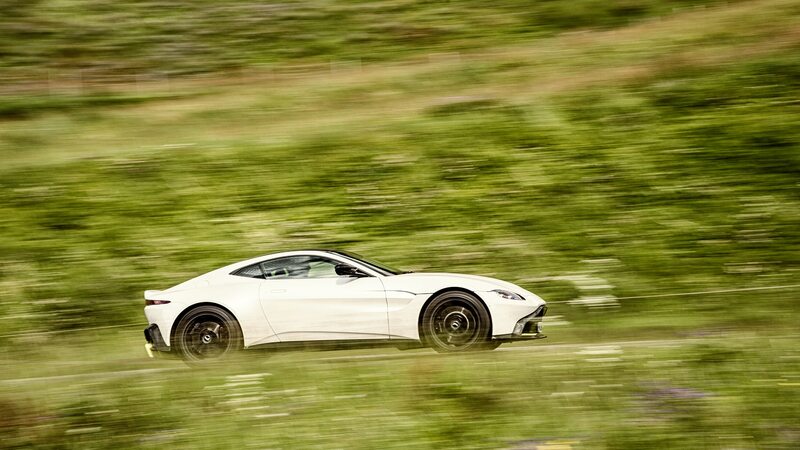 Last to leave is the even more vocal and melodic metallic white Aston, looking like a streak of motile ice as it spirals out of sight. These sledgehammers dance along the edge of adhesion like Nureyev after a third vodka. It’s still early in the day, and so far this is only six- or seven-tenths stuff. 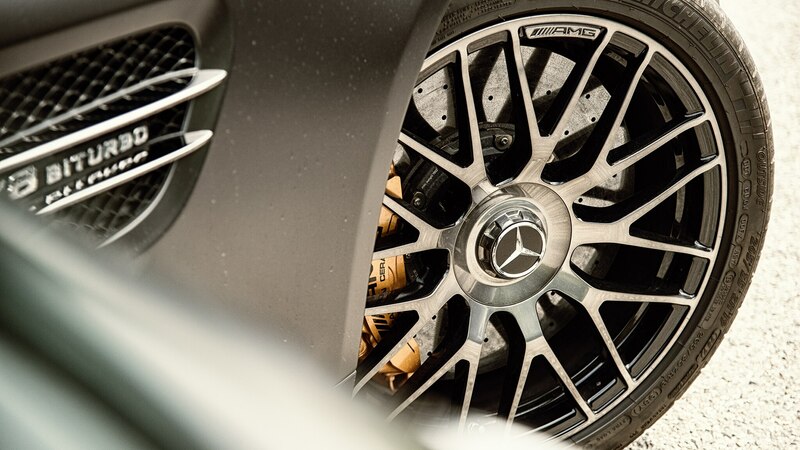 The Michelins and Pirellis need warming up, the brakes are still grabby from a frosty night, and the motherboards inside our heads need reprogramming. 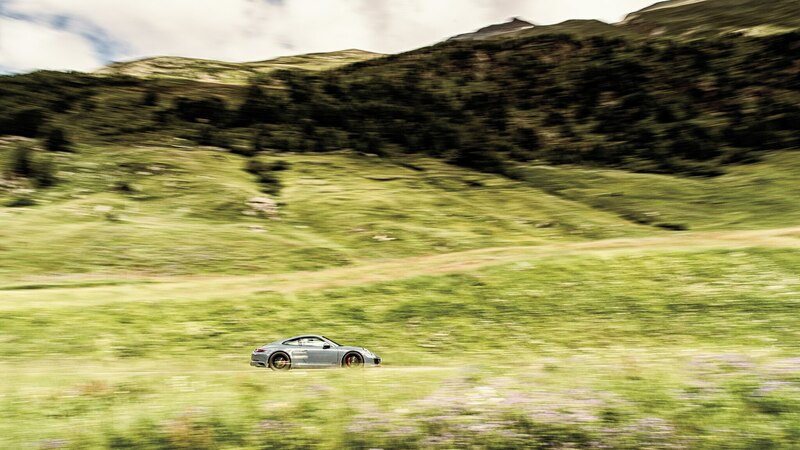 The surface is dappled with blacktop patches, some corners are off-camber, and water from the glaciers overhead sprinkles the road here and there. Downhill, every section is good for third or fourth gear. Twice, fifth would be an option, but 125 mph on this type of road is begging for a prime spot at the mortuary. 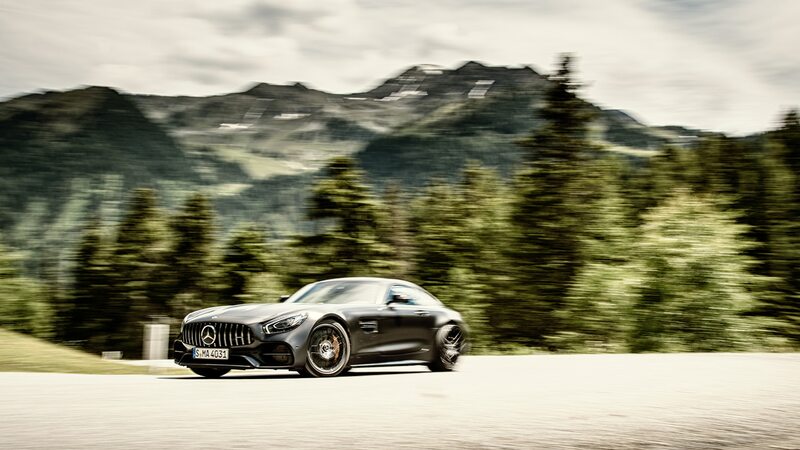 While the AMG GT S would—on paper—be a better fit for our test, the GT C with the Dynamic Plus pack and carbon-ceramic brakes is every bit as good. 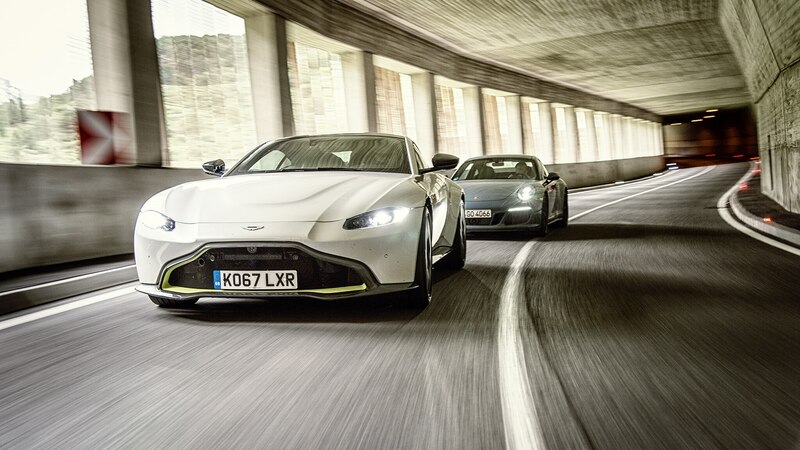 Money-wise, it’s almost a dead heat between the Vantage and the GT C, which share the same 4.0-liter twin-turbo V-8. 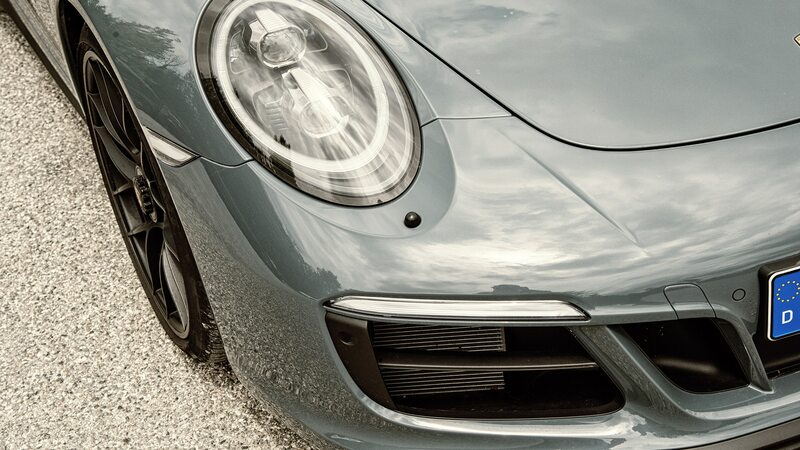 The Porsche is the least expensive contender and the only carryover model. 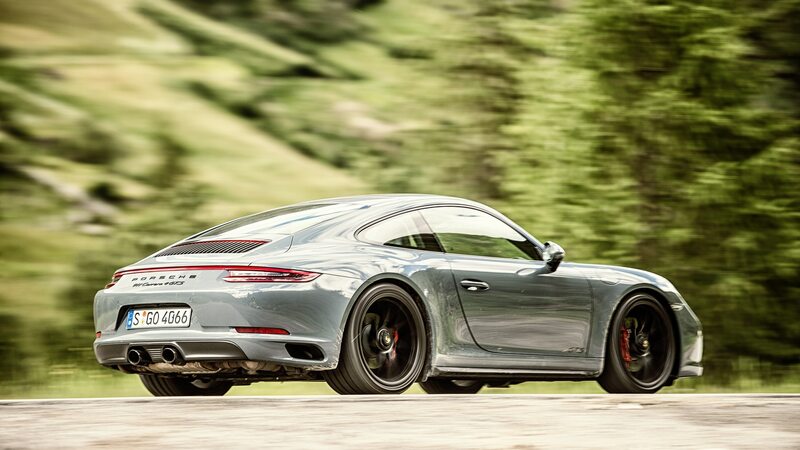 All were delivered fully loaded, though the Porsche lacks the optional rear-wheel steering. 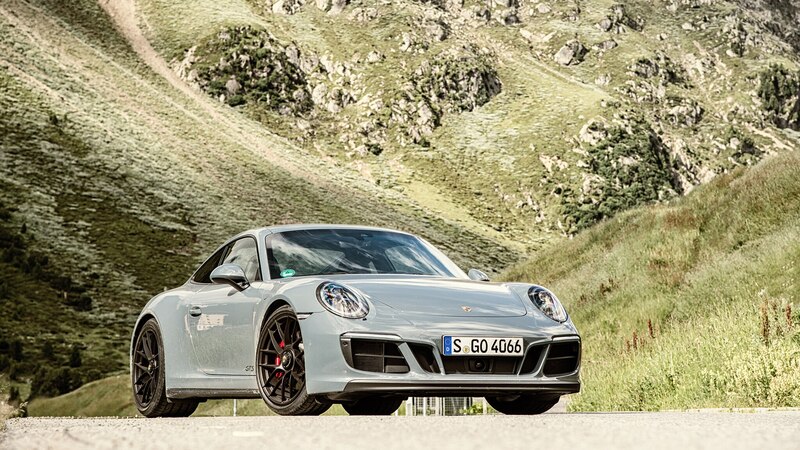 Complete with sunroof and comfort seats, the 911 is kind of an antidote to the big, bad Benz. 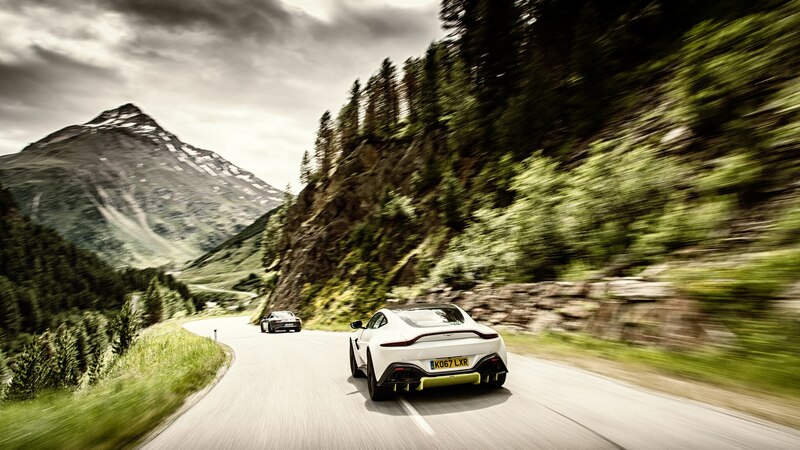 The Vantage sits in the middle, a GT with the soul of a sports car. 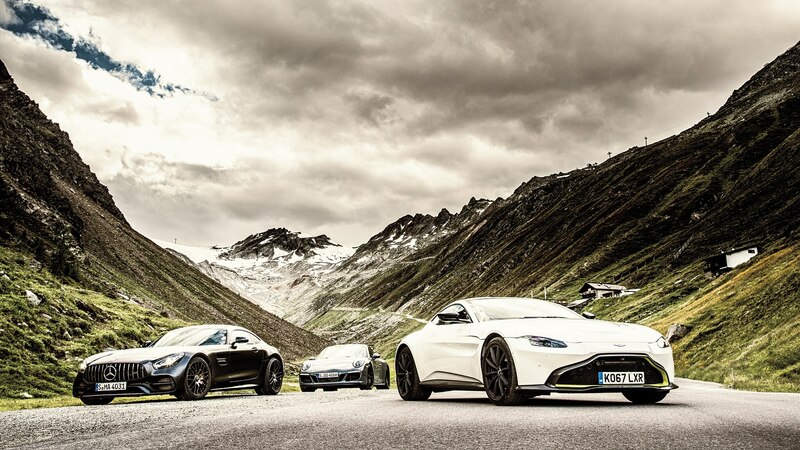 Performance is far from the deciding factor in this comparison. 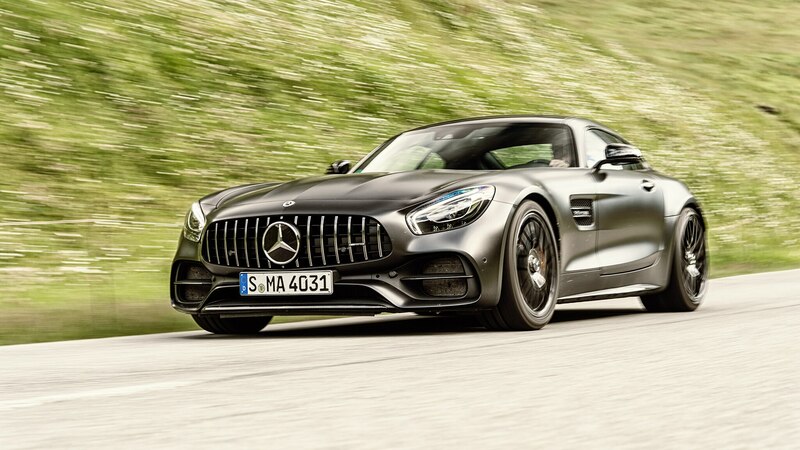 The entrants go grille to grille in the 0-60 sprint; even at top speed, the fastest car (AMG GT C, 196 mph) beats the least fast (911, 191 mph) by a mere token gesture, and in-gear acceleration times are equally close. 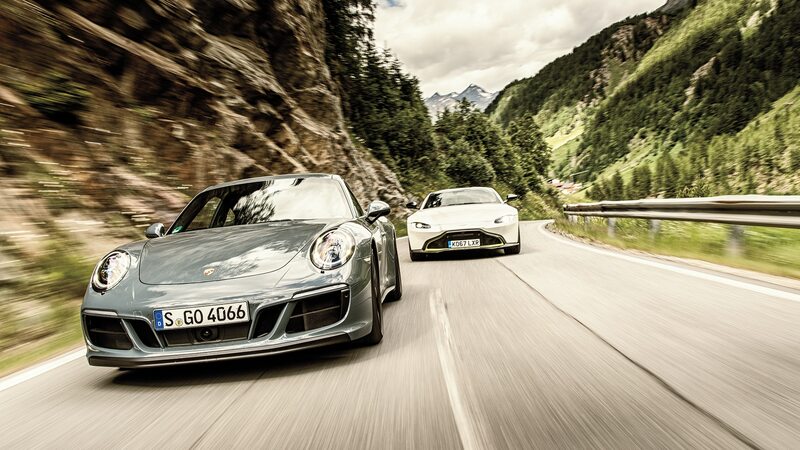 There’s not much separating power and torque, either. 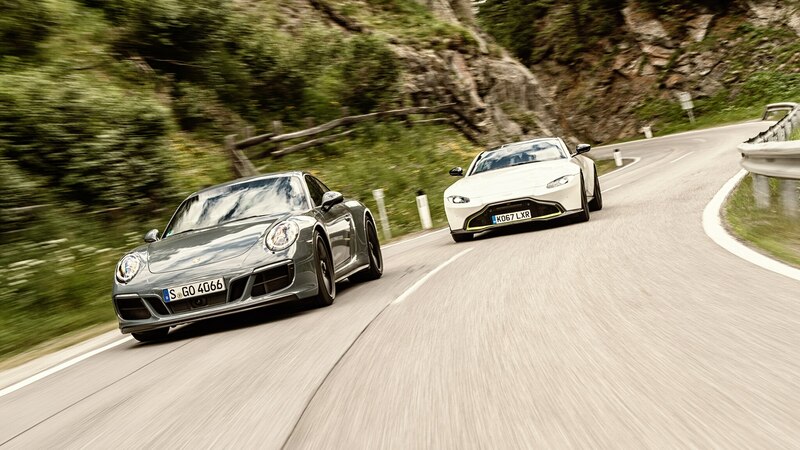 The Porsche’s flat-six lays down the least at 450 hp and 405 lb-ft, but it’s also more than 400 pounds lighter than the 3,748-pound, 550-hp, 502-lb-ft GT C. Aston claims a dry weight of 3,373 pounds for the 503-hp, 505-lb-ft Vantage, which suggests around 3,650 pounds or more all in. 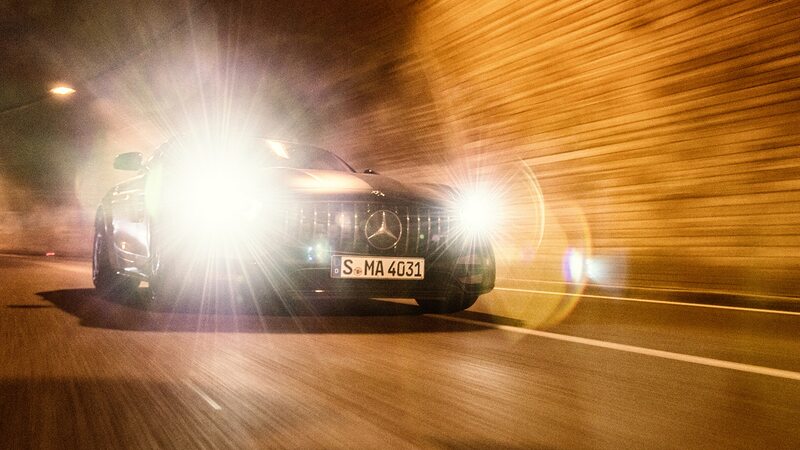 As for real-life fuel consumption figures, the AMG was thirstiest during our two-day, 400-mile excursion on a route sans autobahns or city driving (the Aston slightly less so), with the 911 consuming the least amount of super unleaded by far. Speed check: We found plenty of velocity, but these cars require judicious inputs on this type of road. 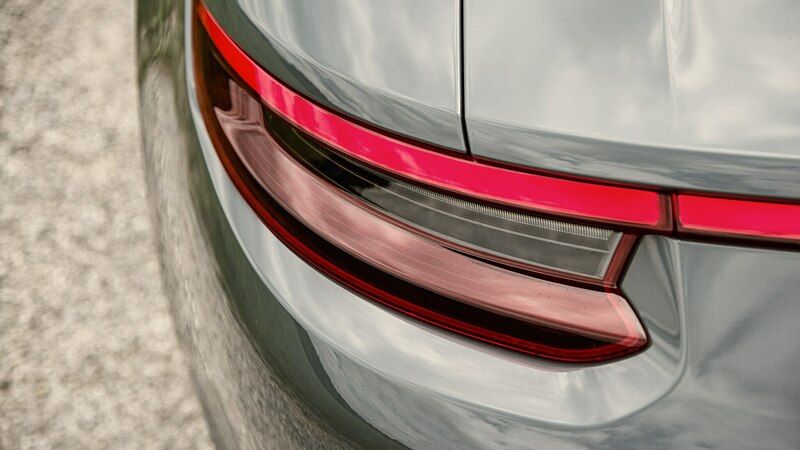 Entering the 911 feels like coming home. 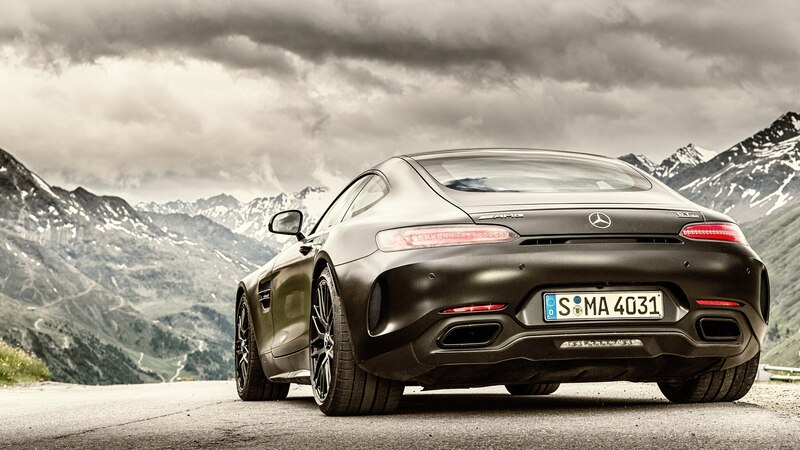 Despite the updated, semi-contemporary infotainment system and a choice of driving programs, the rear-engine coupe is still pleasantly Olde Worlde in the way it looks, feels, and does its job. 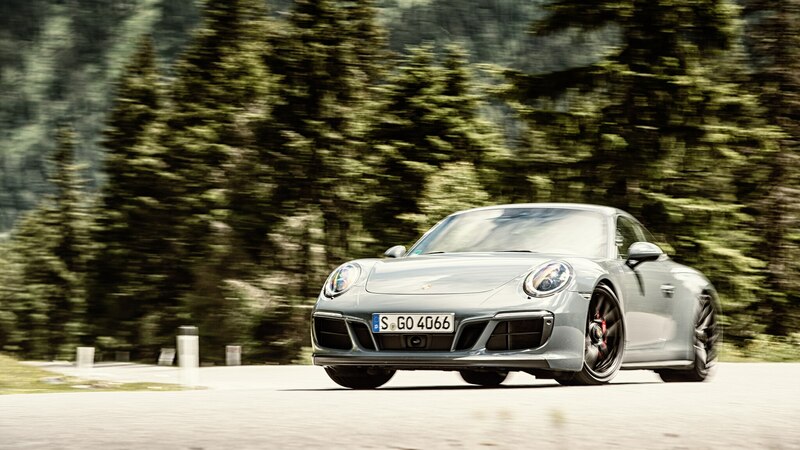 On tight and winding roads, one quickly appreciates its more compact dimensions, lighter weight, and comparatively comfortable suspension. 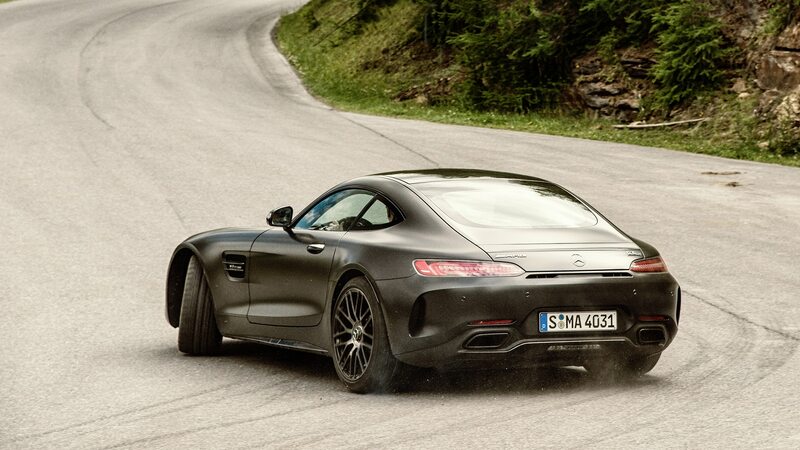 The Mercedes-AMG GT C, on the other hand, packs a 3XL rear track, the longest hood this side of a prewar SSK roadster, and shoulders almost too broad for an automatic car wash. While great for blat-blatting down Fifth Avenue in first gear, as soon as a hazard—pothole, cyclist, oncoming traffic—pops up on a real road, the margin for error shrinks to zero before you can utter a four-letter word. 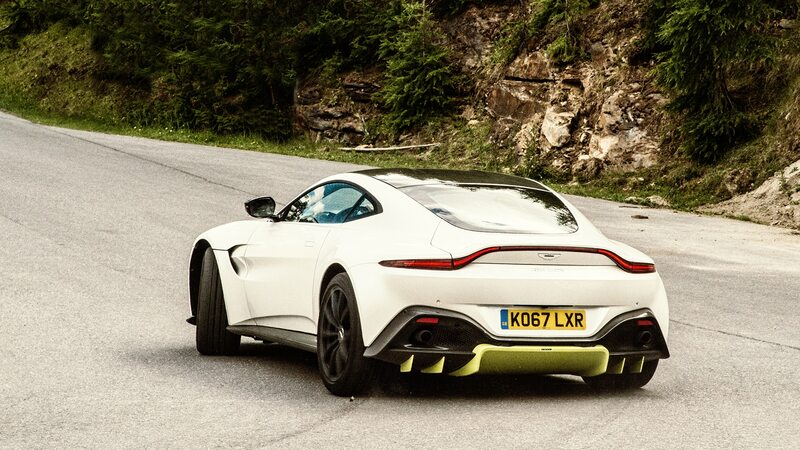 The Aston isn’t quite as bloated (er, muscular) as the Benz, but it too high-fives roadside flowers and peppers the wheelwells with gravel picked up from the soft shoulder. 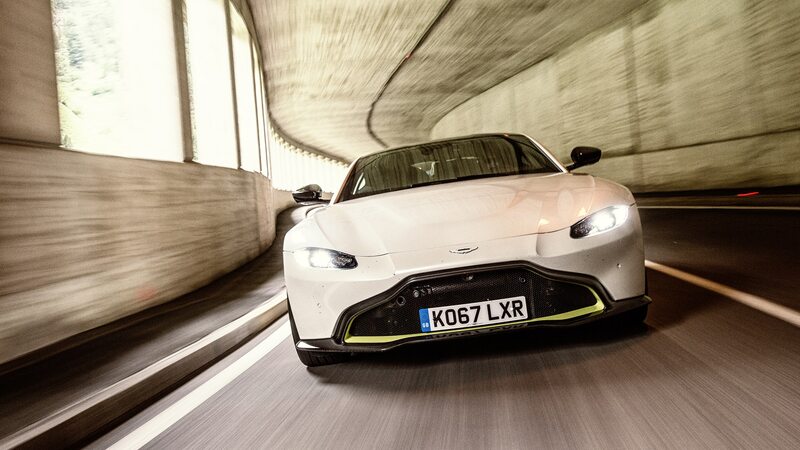 Set ESP in handling mode or switch it off altogether, and these front-engine sledgehammers dance along the edge of adhesion like Nureyev after a third vodka. 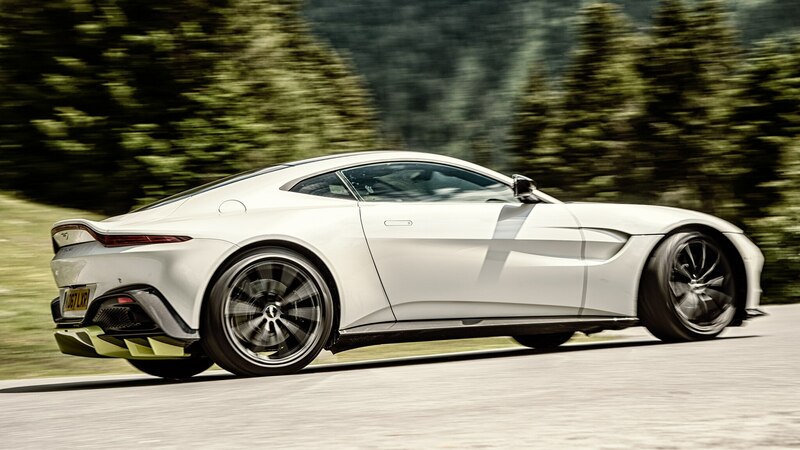 The Aston has the most well-rounded transmission by a whisker, a no-frills eight-speed transaxle automatic supplied by ZF. It’s a quick-shifting set of cogs that adapts nicely to predetermined degrees of excitement named Sport, Sport Plus, and Track. 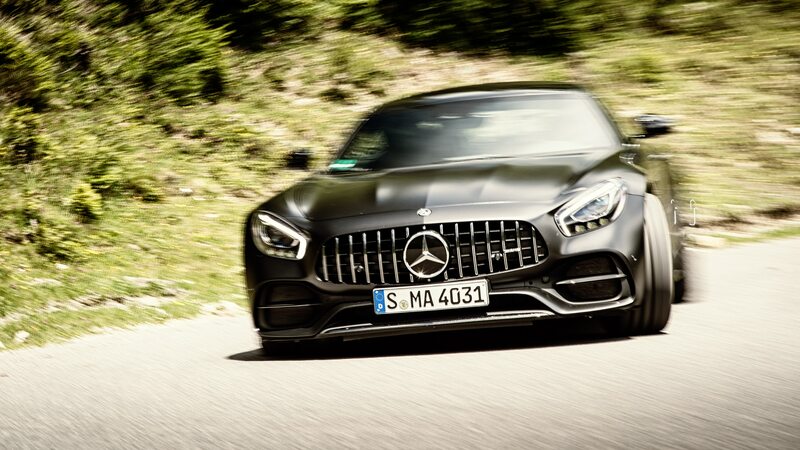 The seven-speed DCT fitted to the GT C might be an eye blink faster, and it can certainly change gears with greater ferocity, but downshifts tend to be lumpy, and after a hard day’s work our test car developed an odd takeoff hiccup that was fortunately gone the next morning. 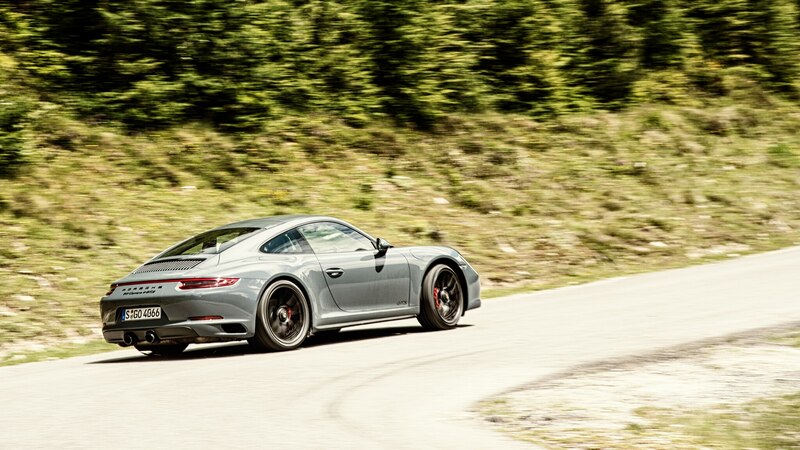 The 911’s PDK has a lot going for it too. 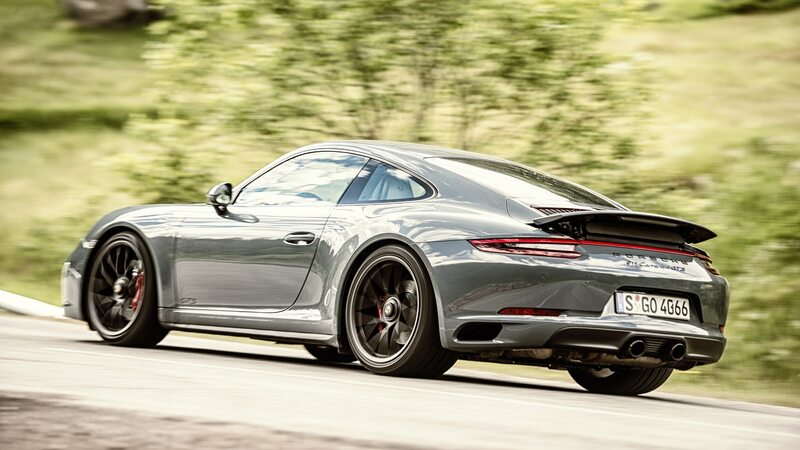 Although it’s light-years quicker than that bagful of antlers known as a manual gearbox, sadly the Porsche powerbrokers chose a frustrating emissions-biased calibration that automatically selects the tallest available gear and coasts whenever possible—though it downshifts promptly when the throttle is opened wide. Selecting Sport or Sport Plus does change things up, namely to the tune of earlier downshifts, later upshifts, and a tendency to avoid fifth through seventh. 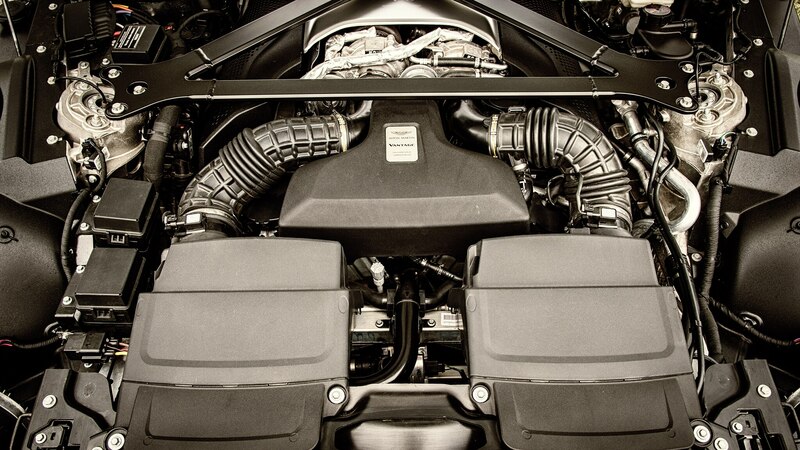 Below 2,000 rpm, none of the three engines is overeager to jump out of bed. 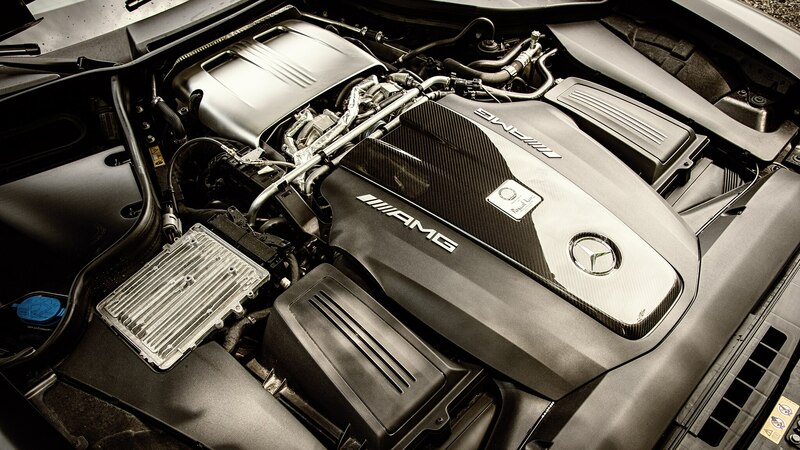 But get near 7,000 (AMG, Aston) or 7,500 (Porsche) rpm, and climax is unanimously spelled with a triple X. 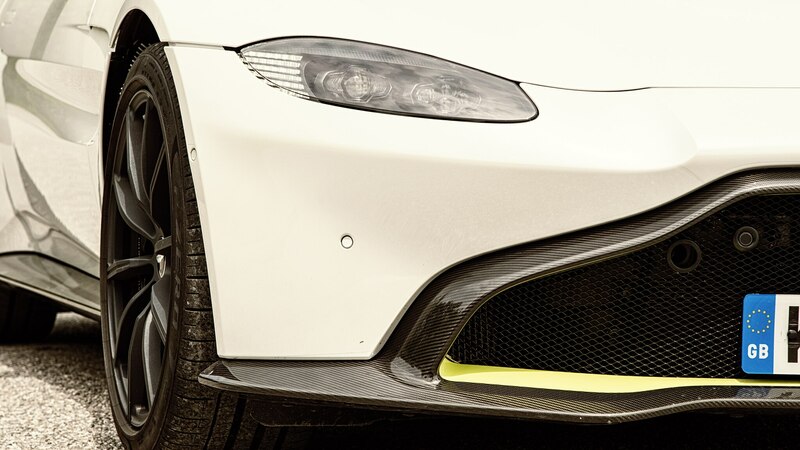 If you want to frighten not just your next-door neighbor but the whole street, hit the button adorned with an exhaust symbol, or, in the case of the Vantage, keep the starter button pushed for more than 3 seconds. 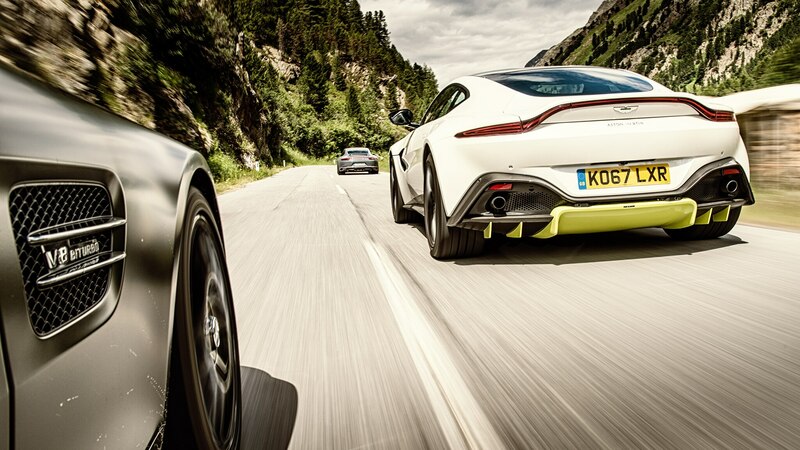 The result is unabashed puerility, though none quite matches the sonic overkill of Ferrari & Friends. 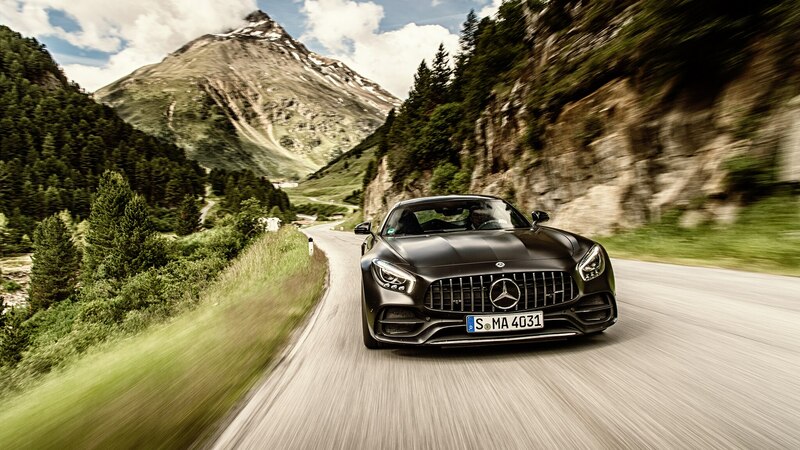 Fast descents like the road from Vent to Zwieselstein are a baptism by fire for steering, suspension, and brakes—especially brakes. 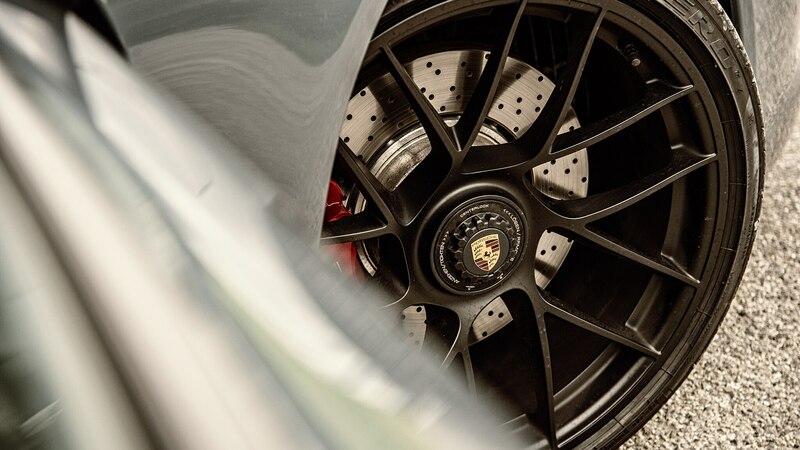 While carbon-ceramic rotors never made much difference in the numerous 911s we’ve driven, the copper-colored, high-performance calipers and carbon-ceramic discs that glisten behind the wheels of the GT C combine amazing stopping power with inexhaustible stamina. 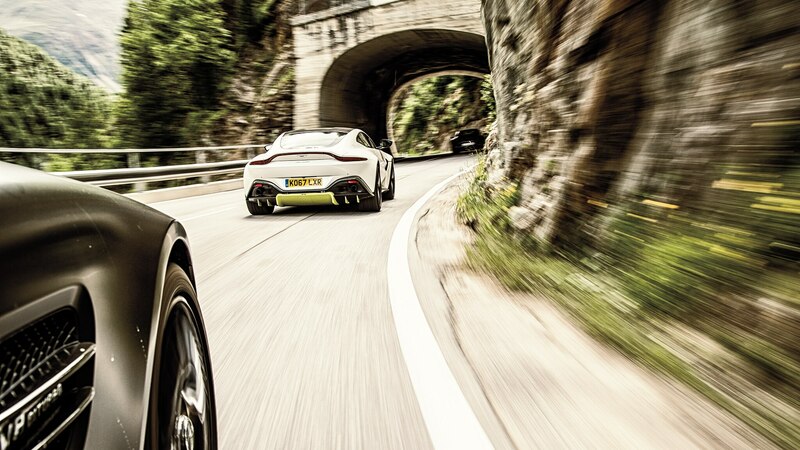 Pedal pressure and travel never vary, and because the front end turns in without greasing so much as half an inch off-line, braking deep into bends soon becomes second nature. 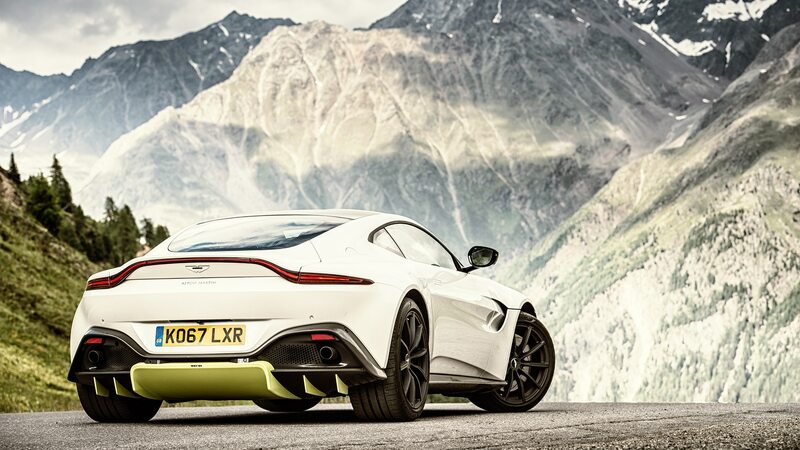 The Aston does all that, too, though without the same abandon, and it requires warm tires and hot brakes to provide the kind of brutal deceleration that tests your neck muscles. 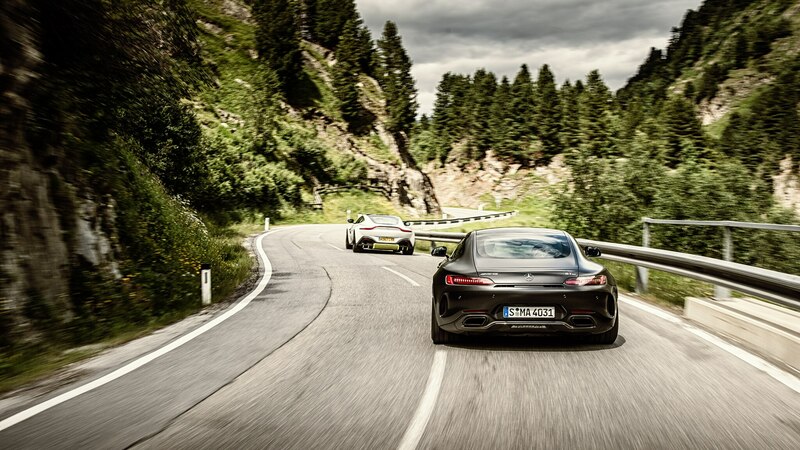 Juggling mass and momentum is particularly effortless in the Porsche until ABS intervention interrupts play early, which happens quite frequently due to the lighter front axle load of the rear-engine layout. 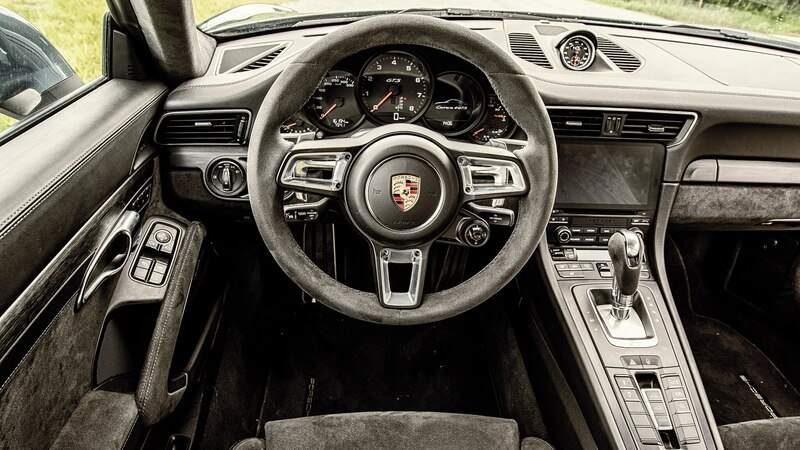 A knob attached to the steering wheel of the 911 offers a choice of four modes, plus a boost button that pours on even more torque—for 20 seconds, anyway. 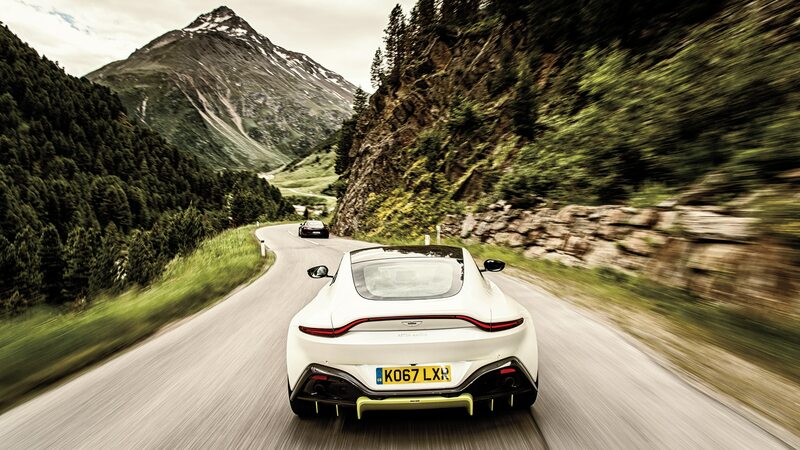 Unless your commute includes a section of the Nordschleife, this feature is little more than a gimmick. 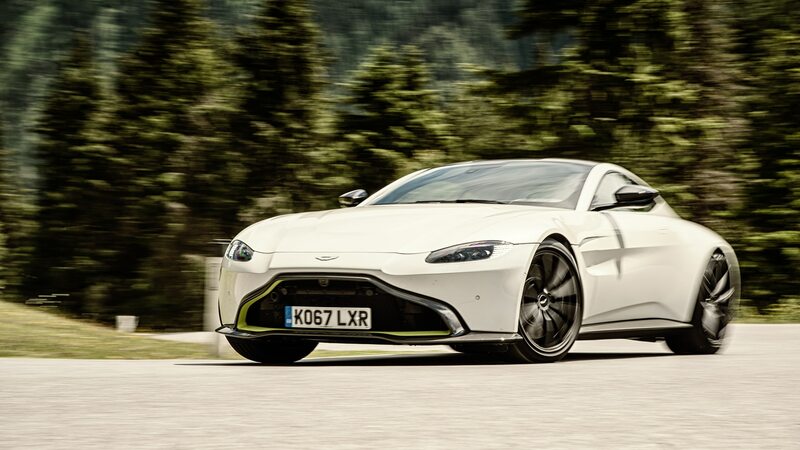 The GT C can be tweaked by the mode selector in the center console and via direct control buttons tweaking dampers and ESP, though even Race mode is of little use for fast-but-not-insanely-fast stints on secondary roads. In principle, the Vantage way of calibrating its DNA is the most logical and pragmatic. Access is via two three-way buttons on the steering wheel, one linked to the dampers, the other to the drivetrain. 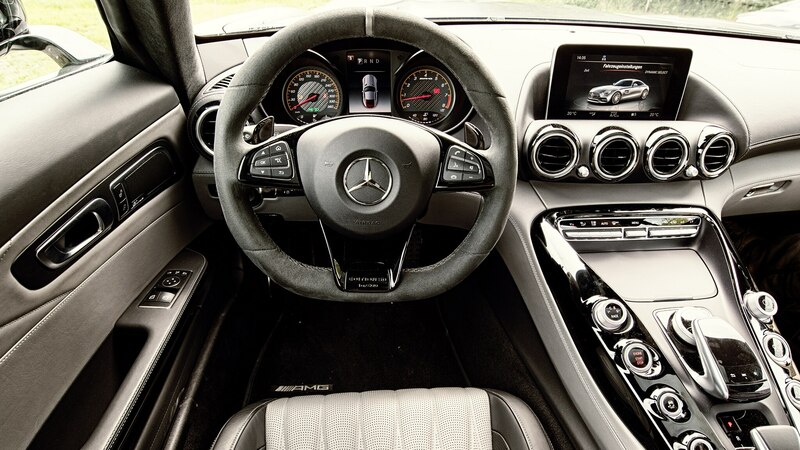 Sport, Sport Plus, and even Track are OK for early Sunday mornings, but ESP needs to be addressed separately via one of 15 buttons grouped around the touchpad and infotainment system also supplied by Mercedes. Then there’s steering. 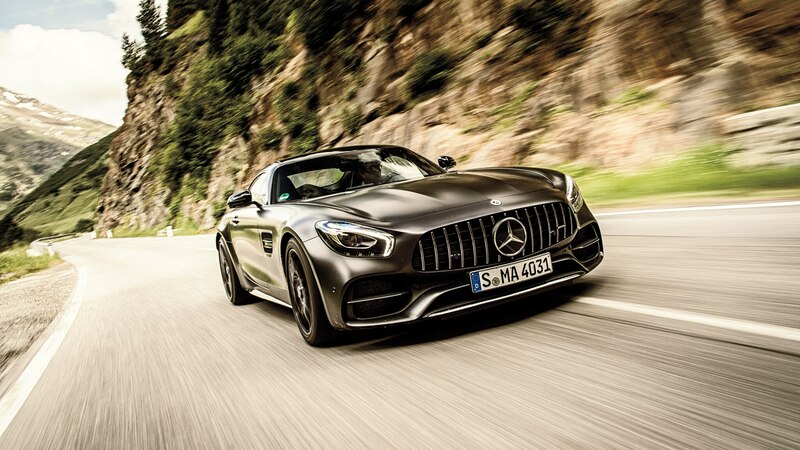 The AMG guys like the helm to be stable and firm, at least around the straight-ahead position. 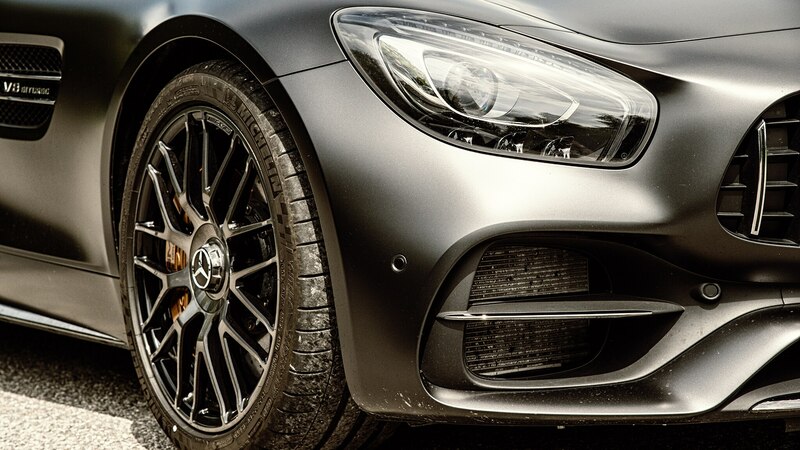 This setup makes a car that can be a bit nervous at times feel less wayward on bumpy asphalt. 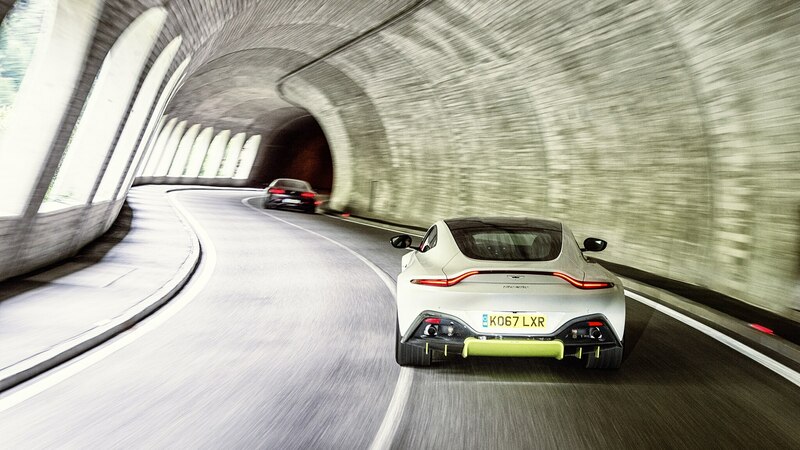 As soon as you turn in with vigor, though, the hotline between the front wheels and the driver’s hands fades just a little, triggering a dash of indifference and an unexpected lightness. 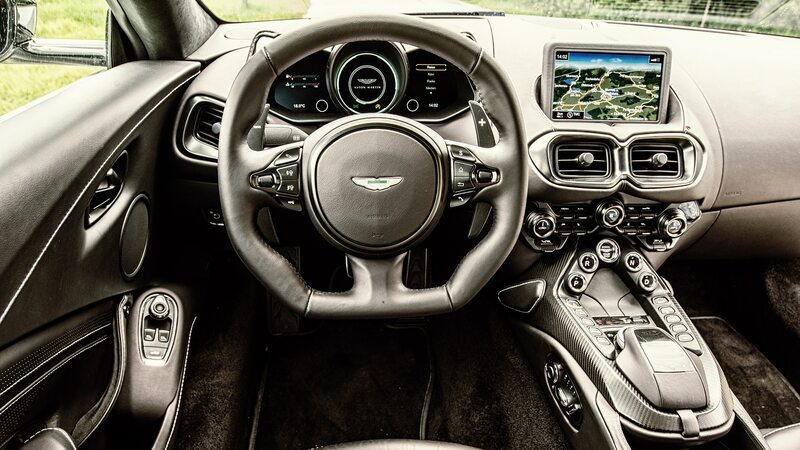 In our quest for a firmer, more positive feel, we switched to the Vantage, only to frown at its silly squared-off, Austin Allegro-style Quartic steering wheel. The rack tuned by the Brits does indeed turn in a tad more progressively, and it’s a touch stiffer and marginally less artificial overall. 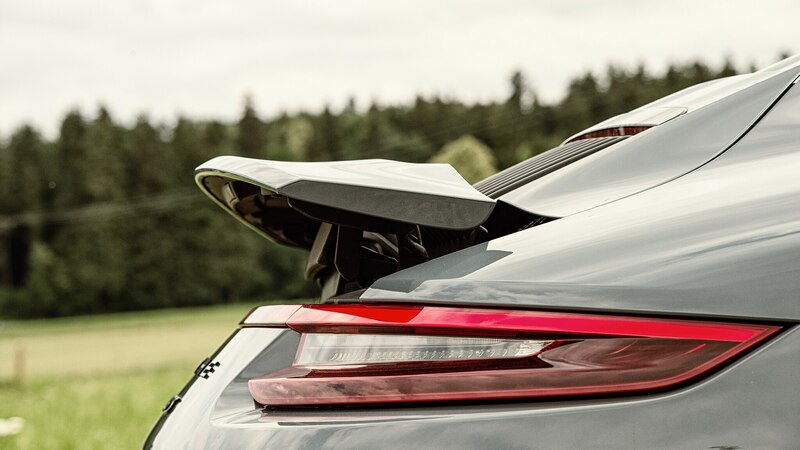 Having said that, changing direction in the Carrera 4 GTS is an even more seamless task, effortless and responsive without filters or flavor enhancers. We arrive at the top of the next pass just before the tollgate closes for the night. 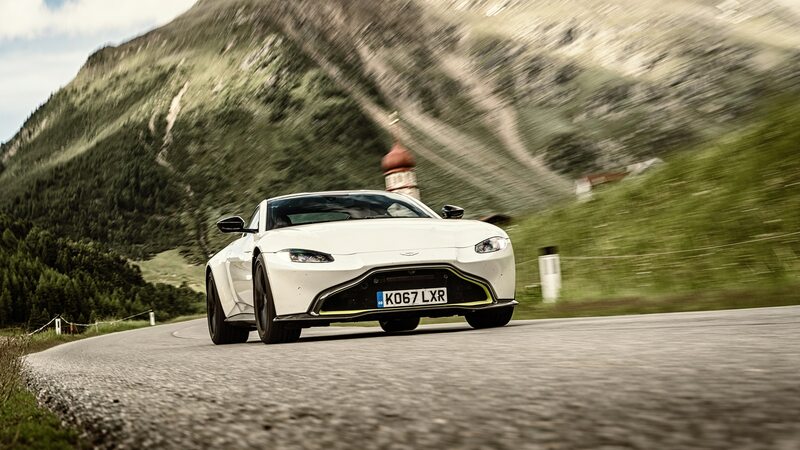 It’s a mixed bag of challenges, including wide-open straights, narrow crests framed by panoramic sky, pairs of U-shaped aquaplaning ruts topped by freshly laid asphalt, corners fast and slow, light rain, and blaring sunshine. 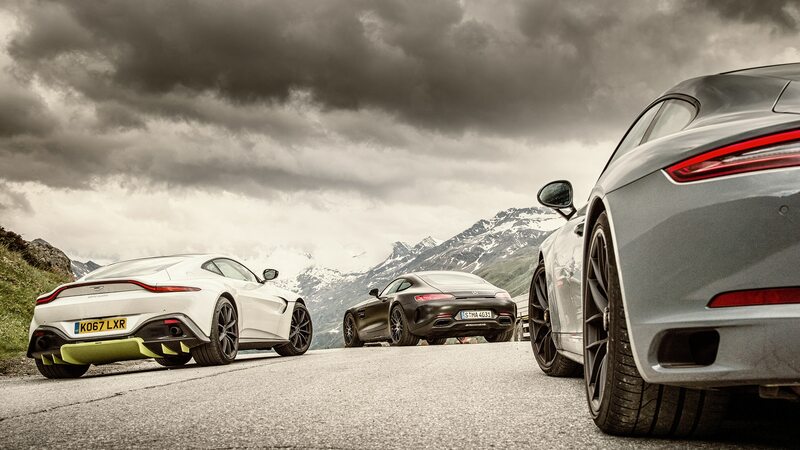 On mirror-smooth roads, all three contenders score 11 out of 10 for unbridled entertainment and sure-footed confidence. 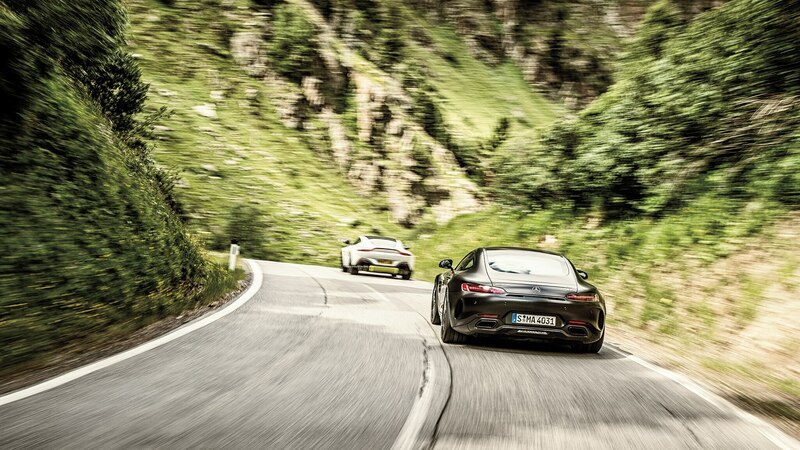 But when the going gets rough, even the 911—nimble and involving as it is—balks at transverse ripples, deep grooves, and patchwork terrain where the front axle feels more restless than it should. 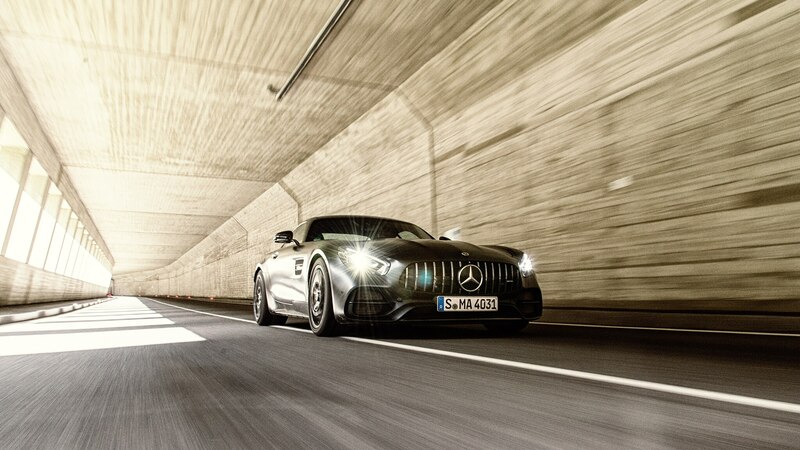 The AMG is hampered at times by a less than optimum low-speed ride, chronic tramlining, and that busy rear axle. 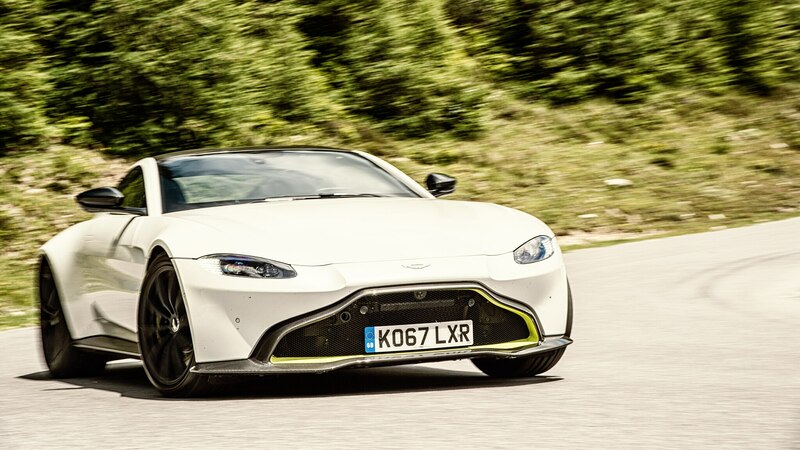 But its standard rear-wheel steering helps sort out those torque vectors while calming the eye of the kinematic hurricane you sit on. 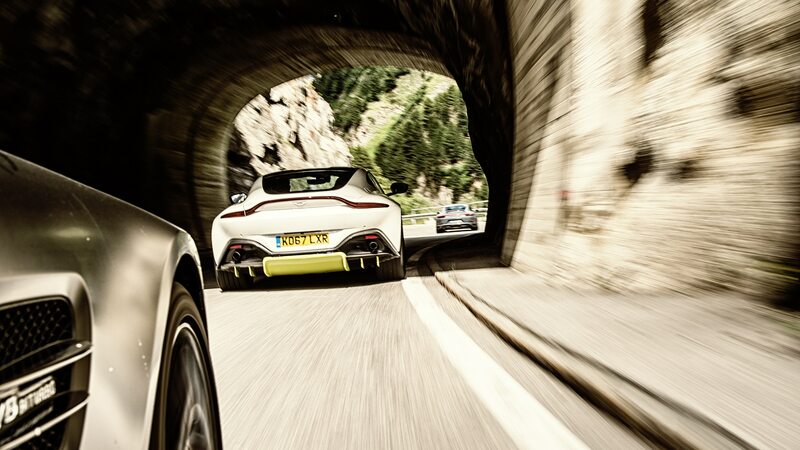 Wedged in: None of the interiors wowed us, but that’s not what this exercise is about. 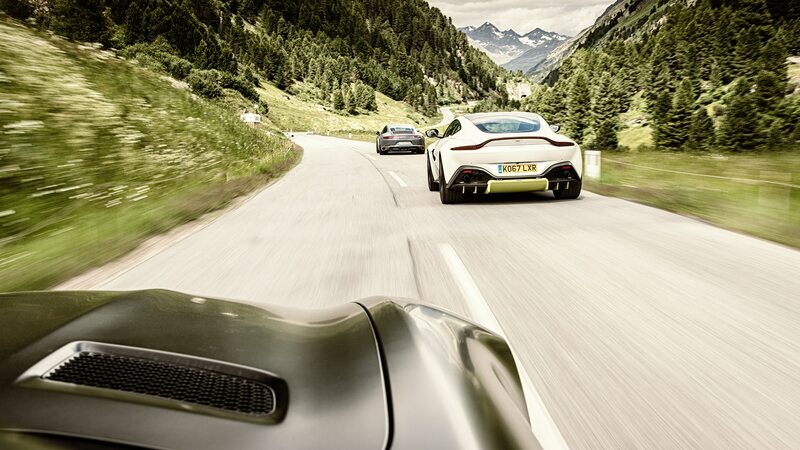 The Vantage feels at home in racing suits or three-piece suits. 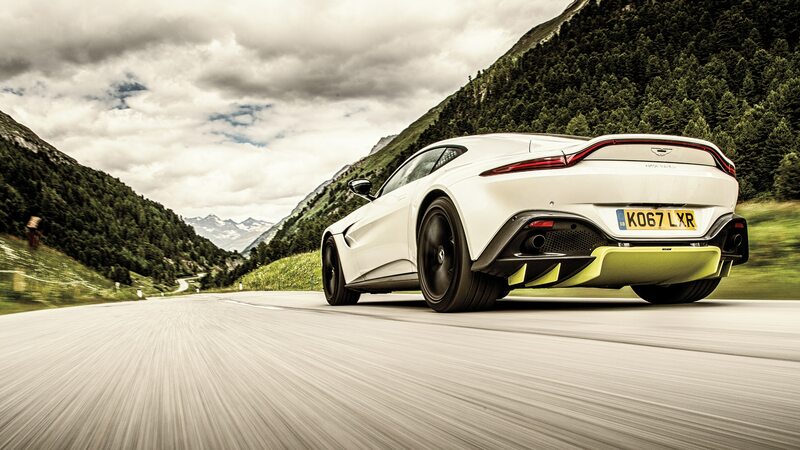 It rules the fast lane and runs with the best of them through the twisties. 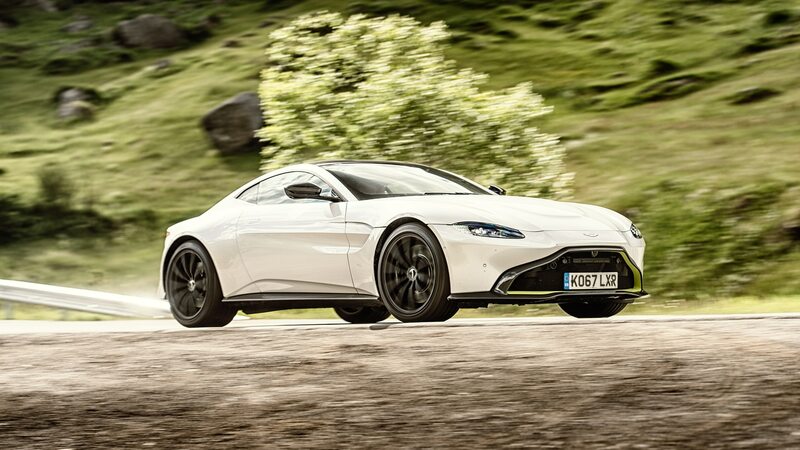 As it doesn’t deploy things like rear-wheel steering, all-wheel drive (and was hampered some by a wonky e-diff), high-performance brakes, active aerodynamics, air suspension, and adjustable anti-roll bars, the new Aston is in essence an old-school sports car. 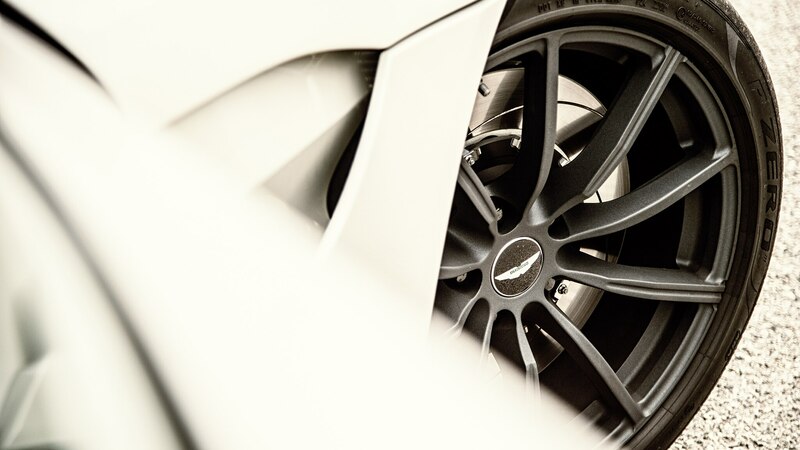 It can’t go through a roundabout without wagging its tail, it’s pure dynamite in the 125 to 185 mph bracket, and it feels fast the way a 797-hp Challenger Redeye feels fast. Trouble is, the suspension comes across as somewhat undersprung and overdamped. 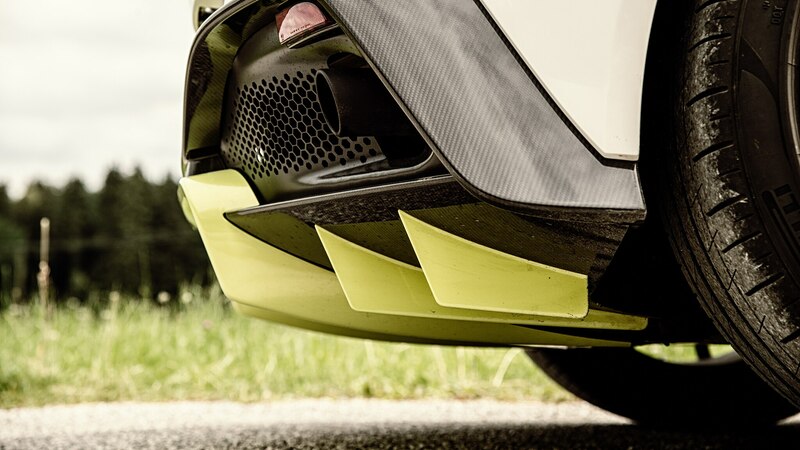 Point the nose toward curvy, uneven terrain, and brace yourself for vertical kicks, which make the car’s rear end tap-dance until ESP cuts in, which is late in handling mode. Can we have a bit more compliance, please? 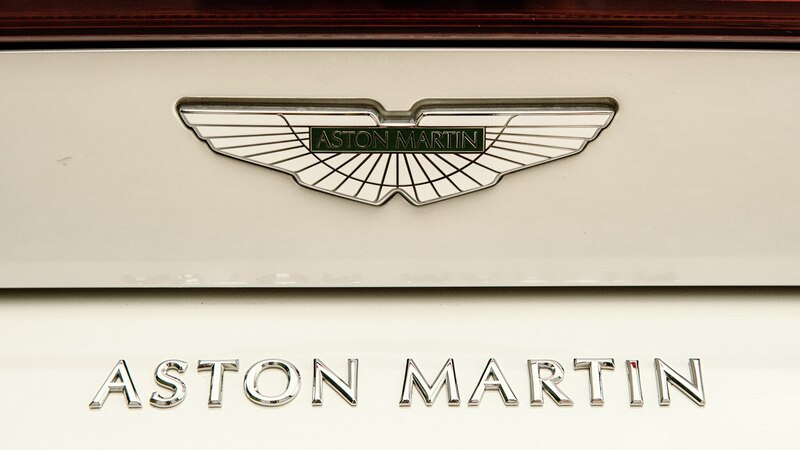 When you drop $150,000-plus on a car, sense of occasion usually ranks high on the list of buying motives. 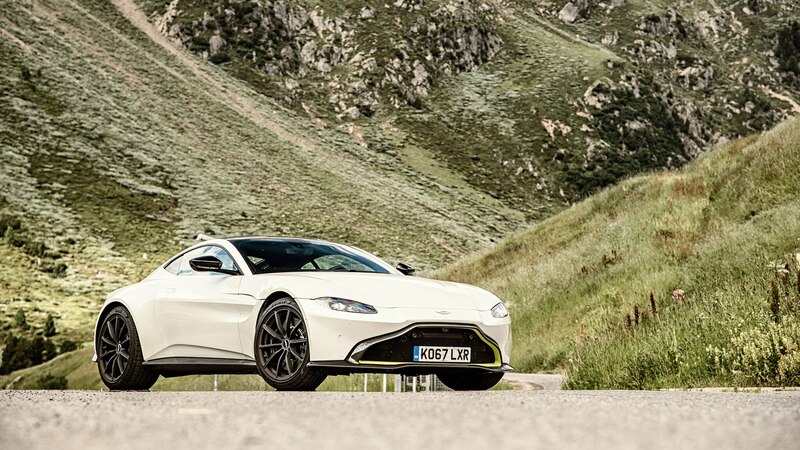 As far as the exterior appearance goes, the sheer presence of the Vantage triggers about twice as many smartphone snaps as the AMG. 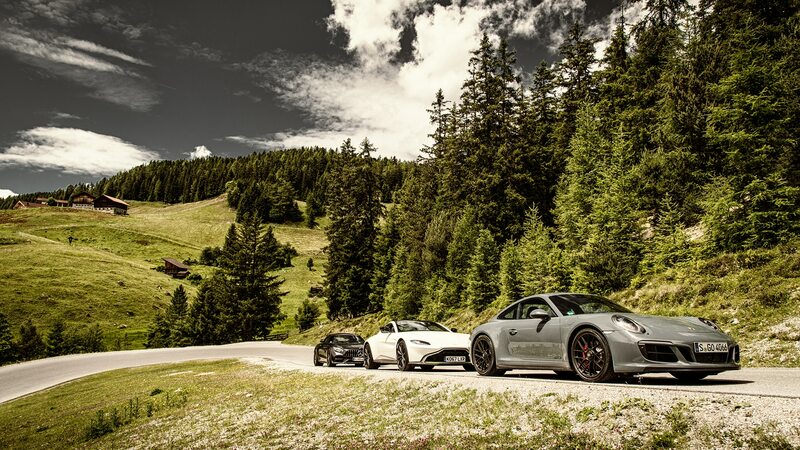 (No one notices the Porsche.) Inside, though, the British wonder is a disappointment, sporting ho-hum surfaces, yesterday’s ergonomics, and uneventful instrumentation. 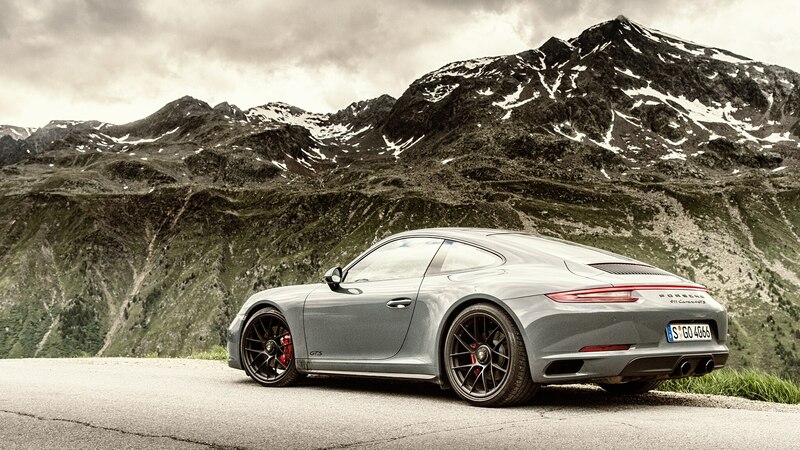 The 911 is better made and has better seats and a roomier cabin. 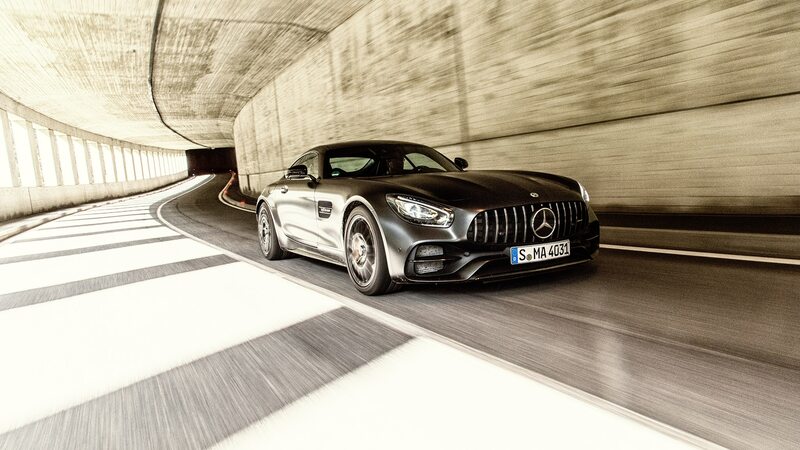 The AMG impresses with its majestic dashboard, flashy electronics, and the expensive ambiance of a material world, but seat travel is compromised by the rear bulkhead, and the ultra-wide transmission tunnel looks as if someone nicked it from an ocean liner. So there’s no real winner here, but then nobody has yet combined a Ferrari steering wheel with Chiron seats, E30 M3 instruments, and Velar ergonomics. 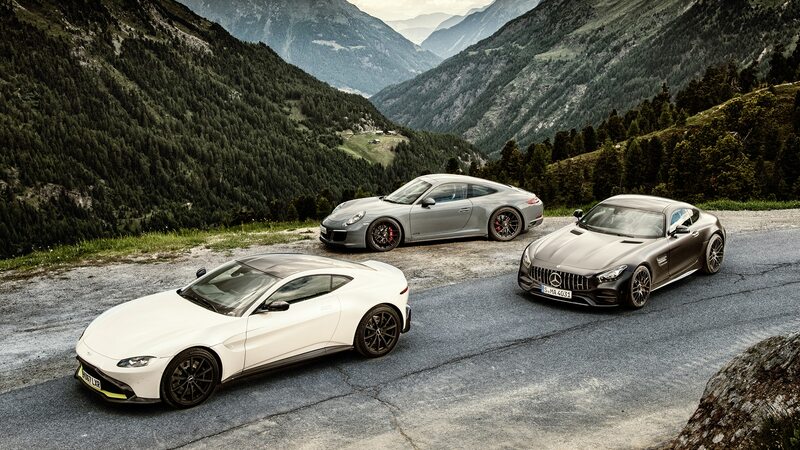 There are quicker cars and there are faster cars than these three, but we wanted for little as we drove this lineup. So which is our pick? 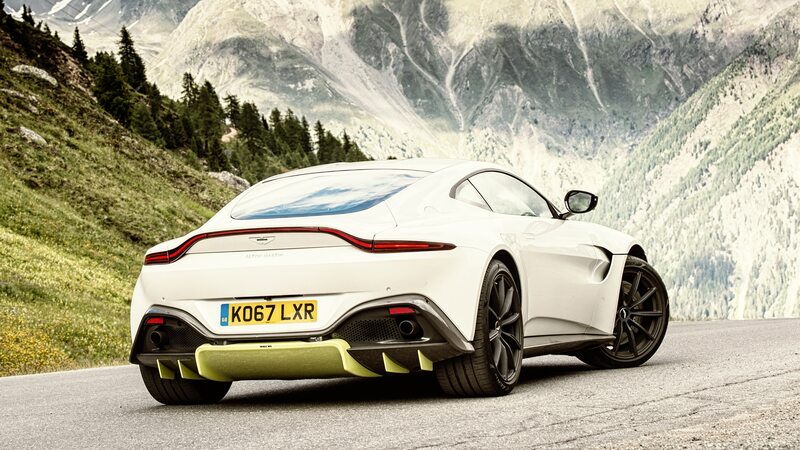 To qualify for the top spot, the Vantage needs a more forgiving ride, a better-balanced suspension, and work done to the interior. 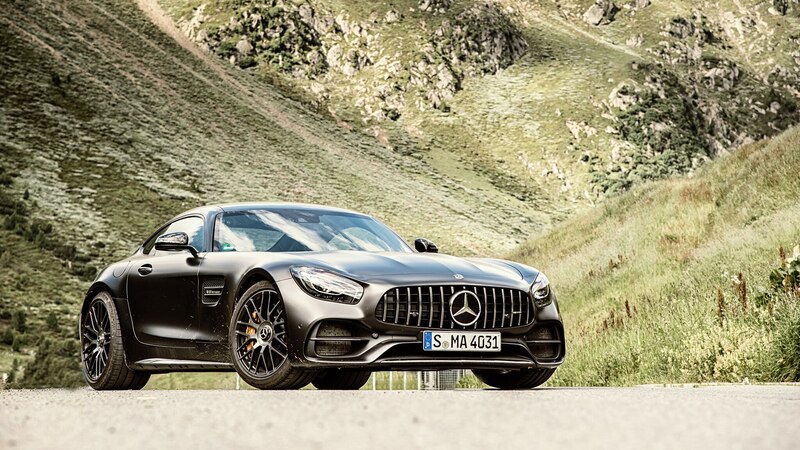 The Benz is a modern muscle car par excellence and oozes hooliganism the instant you hit the exhaust button, but it feels big and has a few dynamic niggles. 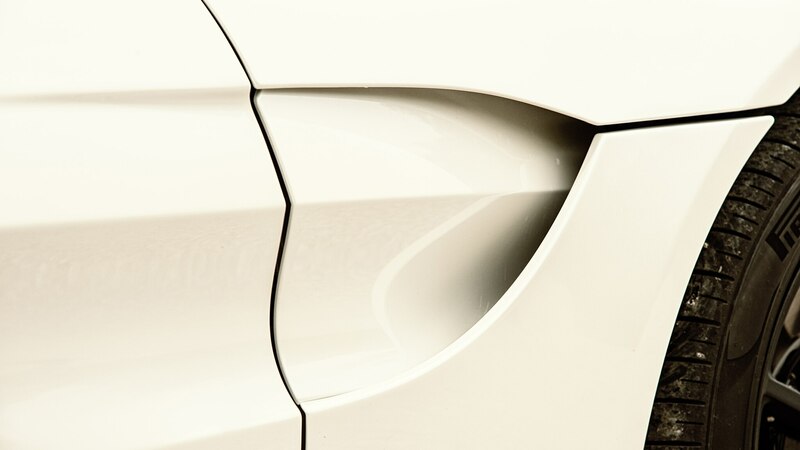 This leaves us with a classic that boasts a timeless design and an impossible engineering concept honed to greatness. 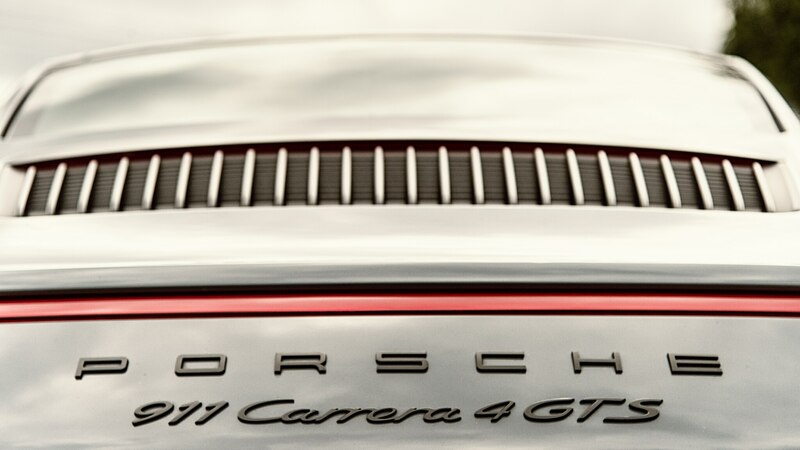 On paper, the 911 GTS is more underdog than overachiever, yet it wins by a bumper for all the reasons that make this icon so iconic. 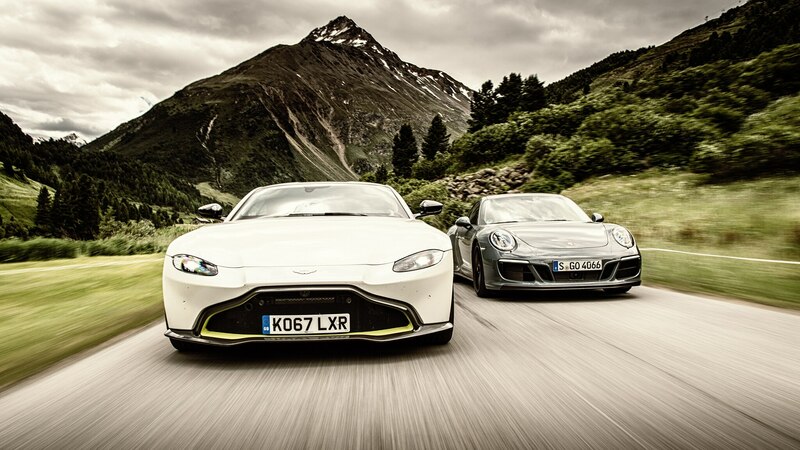 Two staffers square off on Britain’s all-new V-8 super sports car. 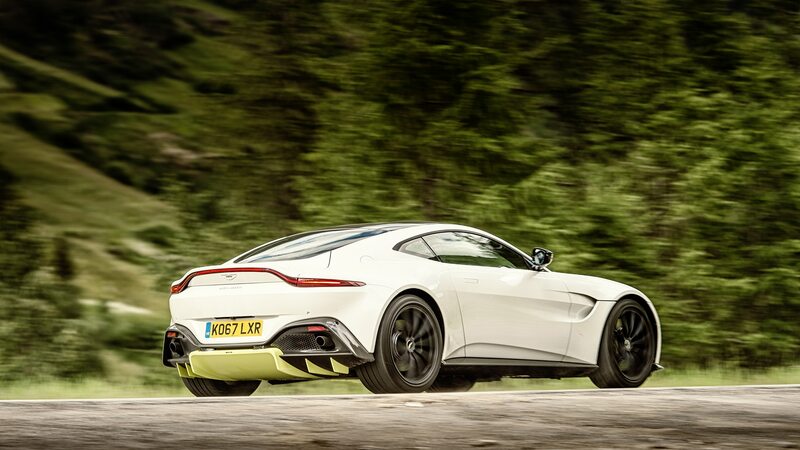 Will Aston Martin’s Mid-Engine Sports Car be Called the Vanquish?